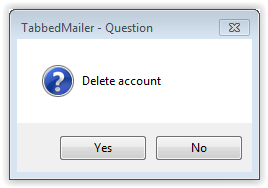 The possibility of the removal of the account intended to the shipment is realized across the click on the menu File, and then selectings from him the position Send accounts. From the right windows we choose which account we want to remove clicking on him, and then on left side windows choosing Delete account. The program will ask us whether surely we want this to make. We click on the button Yes.